The New York Road Runners' Airbnb Brooklyn Half, the largest half-marathon in the United States, sold out in record time on Thursday. The largest half-marathon in the United States sold out in about a quarter of the time it would take many to complete the race. The Airbnb Brooklyn Half, scheduled for May 20, sold out its general entry quota in an eye-opening 26 minutes, a new record, on Thursday afternoon. Brooklyn, located southeast of Manhattan, is the most populous of New York City’s five boroughs. RELATED: New York City silver medallist, Sally Kipyego, becomes U.S. citizen. 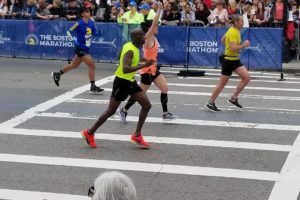 The race, hosted by the New York Road Runners, the same organization that puts on the New York City Marathon, the largest 42K in the world, still has a limited number of charity spots open. The race starts near the Brooklyn Museum and ends with a finish at the Coney Island Boardwalk. “We’re expecting approximately 27,500 finishers,” said Chris Weiller, the senior vice-president of media, public relations and professional athletics at NYRR. RELATED: Calgary Marathon celebrates country’s 150th by printing iconic Canadian illustration on shirts. In 2016, the sell-out time was 52 minutes as runners cut that time in half on Thursday. Registration for the 2017 Brooklyn Half began at noon local time on Jan. 26 as potential entrants scrambled to get their name in. Entry, unlike many of the world’s major marathons, is on a first-come, first-served basis. In 2015, the Brooklyn Half sold out in approximately seven hours as race registration has become increasingly competitive over the past three years. Runners who met certain criteria, like hitting a time standard or volunteering in 2016, were able to gain entry in an advanced window between Jan. 10-19. Registration for non-NYRR members costs US$100.